State-of-the-art technology with premium colour options. 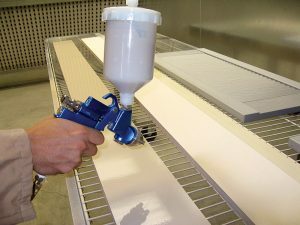 Valor’s Paint Shop uses only LOW VOC waterbase paint which we stock in most popular industry trim and fiber cement colours to ensure quick and efficient delivery. We will colour match a builders paint specification and will manufacture, stock, and paint products on demand for projects. Valor can truly provide you with a single solution for your exterior trim requirements. 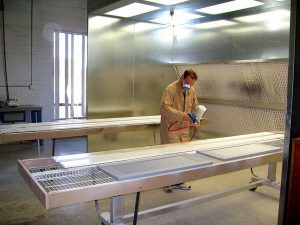 The centuries old “white-wash” water type paint has been transformed in the Aquasurtech paints into the most advanced highly technical water borne industrial coating. It is a matrix of strategically formulated materials which has been balance to yield the highest of performance properties. Aquasurtech is a product line consisting of a thermoplastic coloured protective coating which bonds chemically to the plastic surfaces. The bonded dry film ensures improved performance properties with a smooth, uniform finish. Aquasurtech is a “clean” paint, with minimal odour, which gives an excellent colourful coverage with virtually no harm to the environment. It has been designed in Europe and has been proven in countless applications. It is one of the most technically advanced water based paints in the world which are truly environmentally friendly. Aquasurtech’s paint is extremely high quality and is offered currently with a limited 15 Year Warranty, giving you the confidence and peace of mind to offer this option whenever there’s an opportunity. Valor has received specific application training, and measuring tools to ensure we prepare, and paint our products as required to validate these warranties. Custom paint options for any Valor product. Valor already has the core colours from all major brands of aluminum trim, vinyl siding, and fibre cement siding, matched, although not ALL colours are standard, a premium or minimum run may apply for non standard colours. To ensure the highest quality colour matching we also selected Aquasurtech due to their leading edge photospectrometer for extremely accurate colour matching, 80% more accurate than current North American standard tolerances for colour reproduction, so bring us your builders colour samples! Please contact us for more information, samples, or to discuss your next project!